A World Heritage site, the 13th century Notre-Dame Cathedral of Reims is one of Europe's most important Gothic structures. 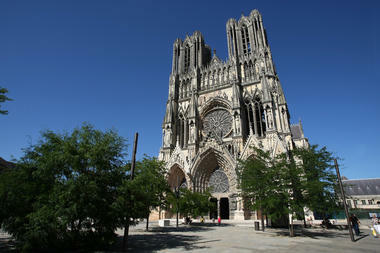 Notre-Dame de Reims is one of Europe's most important Gothic structures. 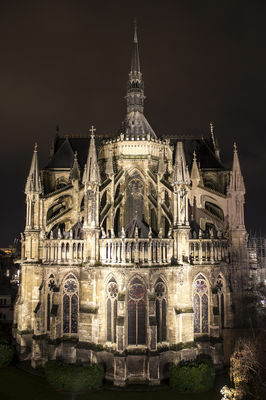 A World Heritage site, the 13th century cathedral has characteristics all its own, in particular its lighting, statuary and unity of style. 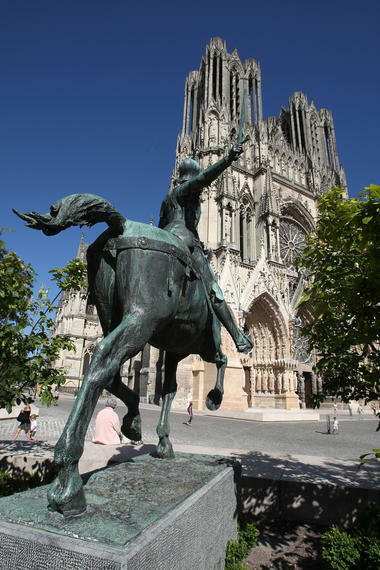 Notre-Dame boasts an exceptionally rich statuary. The cathedral is adorned with 2,303 statues, including the famous Smiling Angel, whose jovial expression reflects the Champagne School of the 13th century. Located in the heart of the city, the cathedral's towers rise above the rooftops of Reims to a height of 81 m. The nave, whose triple-level design is characteristic of the period in which it was built, has a vaulted ceiling some 38 m high. The cathedral is almost 150 m long. 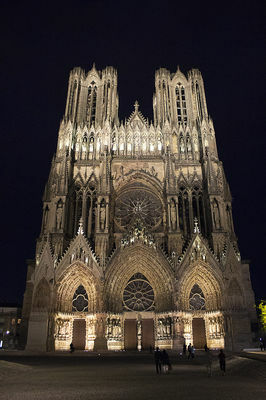 The cathedral is also remarkable for its luminosity, making it a model of the genre in Gothic Europe. A profusion of rosewindows, as well as the delicacy of the windows make this colossal structure remarkably balanced and light. 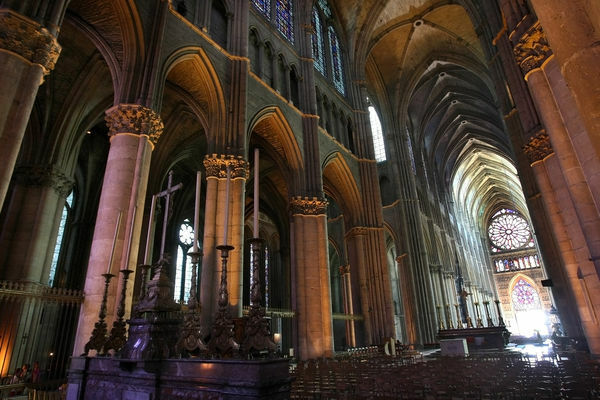 The baptism of Clovis, around the year 498, gave birth to the Kingdom of the Franks. 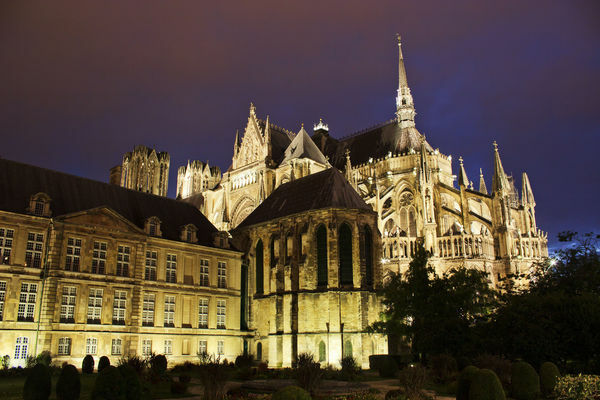 This exceptional event explains the choice of Reims as the coronation city. 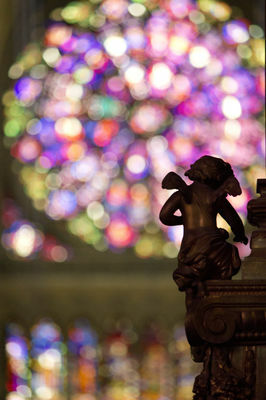 13th, 20th (Chagall, 1974) and 21th century (Knoebel, 2011 and 2015) stained-glass windows. Open everyday from 7.30am to 7.30pm (except during services). 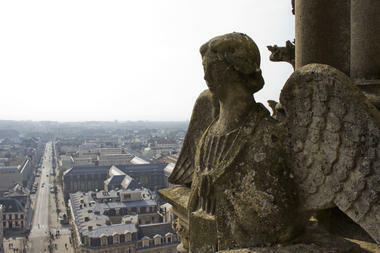 Guided tour of the towers: every week-end from 28 March until 5 May and from 9 September to 31 October. Tuesday through Sunday from 6 May to 8 September. Information at Palace of Tau. 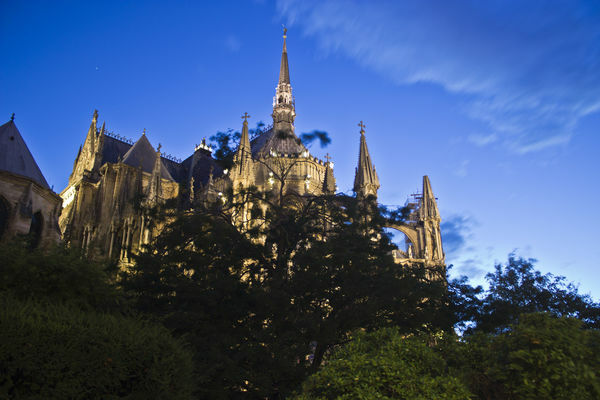 Outdoor lighting of the cathedral at nightfall.